It has been 20 years since I spent the evening at former deputy prime minister Anwar Ibrahim’s house after he was sacked by then prime minister Mahathir Mohamad. That night, I thought the mood on the street outside meant Malaysia might be about to become a genuine multi-ethnic democracy. 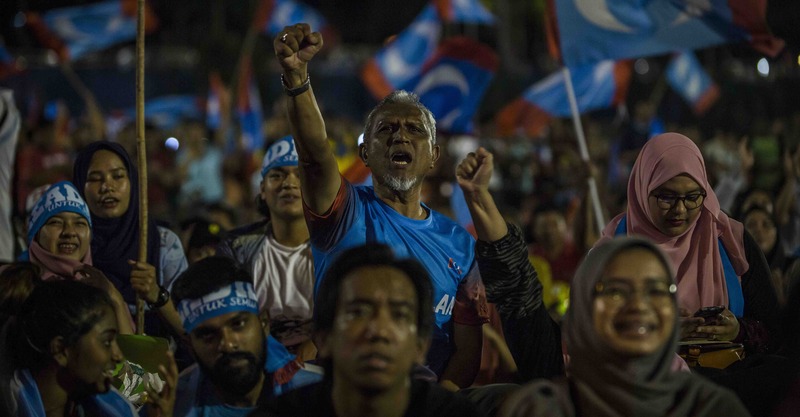 But like so many Asian democratic transitions, it has taken a bigger split in the ruling (Malay) elite than one man’s sacking to bring an end to the world’s longest serving regularly elected government. The triumph of the multiparty, multi-ethnic coalition led by Mahathir at Wednesday’s election is an historic event for Asia given the way the democratic tide has been ebbing in recent years, most notably in neighbouring Thailand. This surprise victory has implications at many levels. Anti-democratic forces in places such as Cambodia and the Philippines will be paying attention. If Malay-chauvinist Malaysia can make such a clean break from the United Malays National Organisation (UMNO), why not more modern and sophisticated Singapore which has been run by the People’s Action Party for almost as long? Both Mahathir and Anwar were activist figures in the Association of Southeast Asian Nations in the past, and that key regional group lacks leadership today. Under outgoing Prime Minister Najib Razak, Malaysia has been an important gateway for China into the region. The prospect of a serious Malay split was always on the cards at this election because of the trend at the last two polls which saw the ruling coalition loose its two-thirds majority in 2008, and then lose the popular vote in 2013. However, a messy vote-buying battle for power among newly elected members of parliament seemed the more likely route to a change of government. Now the victorious Pakatan Harapan coalition will have to form a government from fissiparous elements thrown together for this desperate attempt to overcome the institutional barriers to an election victory. But there is good reason to think this may go well. Despite the racial tensions fanned by Najib’s bid to remain in power and bouts of ethnic tension in the past, there is a deeply embedded multiracial reform movement in Malaysia which will underpin this government. And it is also important to note that both Mahathir and Anwar spent some of their political youth outside the UMNO establishment and have been on the outer in more recent years (much more so for Anwar). So, unlike more inspirational incoming new democrats, such as Aung San Suu Kyi in Myanmar, they are much better placed to take over the reins of government.